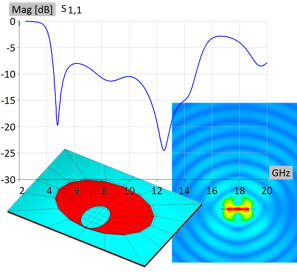 The application note presents WIPL‑D Pro models and simulation results of one of the simplest and widely used antennas – rectangular horn antenna at 10 GHz. Half and quarter of the model were simulated in order to demonstrate the capabilities of symmetry feature in WIPL-D suite. Usage of the Symmetry plane has decreased already low simulation time and the required number of unknowns, while the desired output results differ negligibly (proving the solution accuracy). Electrically large antennas (such as long horns) are simulated in the WIPL-D in seconds owing to the efficient implementation of MoM with HoBF. 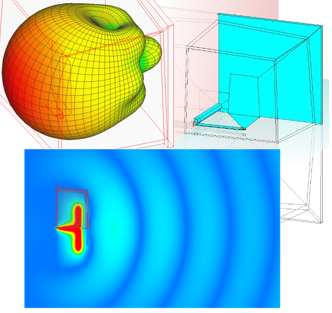 Two models of circular horn antenna were simulated using the WIPL-D software. Special attention is devoted to the dielectrically loaded horn antenna. The influence of the dielectric loading is highlighted and it is the most noticeable in radiation back lobe (significantly suppressed if dielectric load is used). In order to reduce number of unknowns and simulation time, two symmetry planes were successfully used in each model. Both models were simulated very fast with minimum computational requirements, while simulation time is couple of seconds. WIPL-D is a frequency-domain software while the simulated antenna is broad-band (the operating band is from 5 GHz up to 14 GHz). In general, simulation of UWB devices is more demanding in the frequency-domain simulation software, owing to the fact that larger number of frequency points should be simulated. 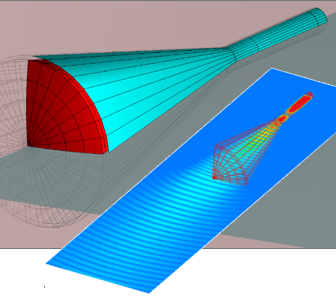 Several features are used to improve simulation time and requirements: usage the Method of Moments with unique application of higher order basis functions, symmetry which halves number of unknowns, and decreased number of frequency points due to built-in interpolation of results. The UWP elliptical antenna is electrically small structure and requires very low number of unknowns. With the code efficient execution on multicore CPUs, the simulation is performed on inexpensive desktop quad core CPU. It laste couple of seconds per frequency point. The Yagi-Uda (further Yagi) antenna is basically a dipole antenna, whose radiation is focused by a series of parallel dipoles and a reflector behind. It is mostly used in radio links for computer (Wi Fi) networks, as well as a receiver for TV and FM radio signals. Two models of Yagi antennas are simulated in WIPL-D. In the first, the radiating element, ten directors and reflector are modeled as wires, while in the second one they are made of plates (solid body). The application of symmetry is discussed in details. Simulations are done extremely quickly (in seconds) at regular desktop PC, with low number of unknowns. The application note also shows the advantages of using the wire models. They are order of magnitude easier to develop and simulate. This can lead to the solution of very complex problems, involving thousands of wire elements, without using the more precise and demanding plate models. Ultra-High Frequency Panel antennas (UHFP antennas) consist of radiating surfaces and reflector. They have been used in TV systems. In the application note, it is covered with radome. Coaxial cable is used for feeding. In order to speed up simulations and to simplify the modelling process, two symmetry planes can be applied. The antenna is simulated in the frequency band 0.47 GHz up to 0.86 GHz. The powerful built in interpolation algorithm allows simulation in minimum number of points. 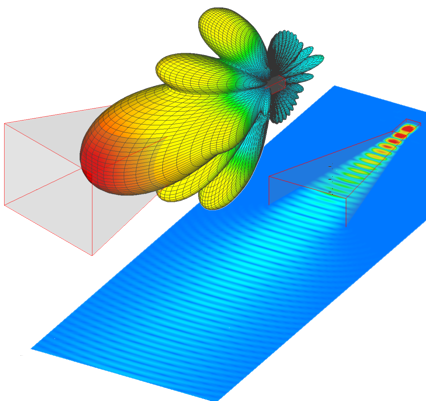 WIPL-D successfully analyzes this antenna for only a a fragment of second on any standard desktop or laptop owing to the efficient implementation of the default simulation Method of Moments. 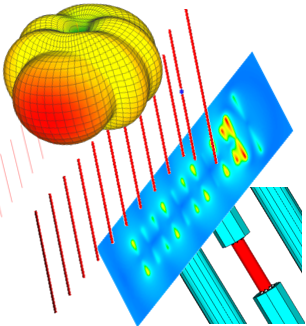 WIPL-D uses unique higher order basis functions which allows modelling of large mesh elements (up to 2 wavelengths). Also, the mesh is realized via generalized quadrilaterals so the code requires two times less unknowns than for the standard triangular mesh. No bounding box is required for open region problems.